This is the seed capsule of a ginger plant, which has a perfumed aroma. Cardamom is often referred to as a typical Christmas spice that is used in Stollen and for flavoring bread. Cardamom comes from the seeds of a ginger-like plant. The small, brown-black sticky seeds are contained in a pod in three double rows with about six seeds in each row. Procuring: It is native to the East originating in the forests of the western ghats in southern India, where it grows wild. Today it also grows in Sri Lanka, Guatemala, Indo China and Tanzania. 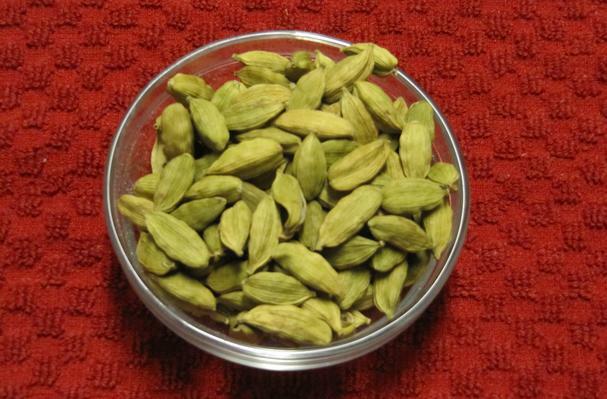 Cardamom are used as flavorings in both food and drink, as cooking spices and as a medicine. In the Middle East, green cardamom powder is used as a spice for sweet dishes as well as traditional flavouring in coffee and tea. Cardamom pods are ground together with coffee beans to produce a powdered mixture of the two, which is boiled with water to make coffee. History: The ancient Egyptians chewed cardamom seeds as a tooth cleaner; the Greeks and Romans used it as a perfume. Vikings came upon cardamom about one thousand years ago, in Constantinople, and introduced it into Scandinavia, where it remains popular to this day.